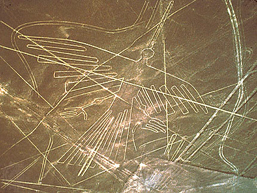 The Nazca Lines are gigantic geoglyphs located between Palpa and Nazca desert, there were created by the Nazca culture between 200 BC and 600 AD. There are many of individual figures, ranging in complexity from simple lines to stylized hummingbirds, spiders, monkeys, and lizards. 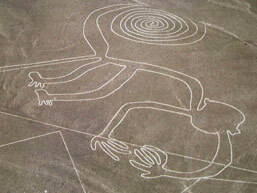 The Nazca lines cannot be recognized as coherent figures except from the air. Early in the morning, pick up at your hotel in Lima and departure to Nasca along the Panamericana highway - 6hrs approx (with private vehicle and English speaking guide for three days). Arrival and drop off at your hotel. PM In the afternoon, over flight of Nasca Lines (30 minute flight, shared service). The Nasca Lines are gigantic geoglyphs located between Palpa and Nasca desert, there were created by the Nasca culture between 200 BC and 600 AD. There are many of individual figures, ranging in complexity from simple lines to stylized hummingbirds, spiders, monkeys, and lizards. The Nasca lines cannot be recognized as coherent figures except from the air. Important note: Over flight to Nasca Lines is subject to weather conditions and it could be done this day or maybe the next day in the morning. Continue to Paracas. Stopover in Ica (3 hrs trip) in where we can visit the very interesting Regional Museum of Ica, which exhibits objects from the Nasca and Paracas cultures. Also, short visit of the oasis of "Huacachina", 5 km west out of Ica with incredible sand dunes completely surrounding it. Arrival to Paracas and drop off at your hotel. On the way to the islands you'll be able to observe the "candelabrum", a figure in the sand dunes which resembles a trident. About the origin of this figure exists various contradicting theories. Arriving at the islands, you'll be able to watch sea lions, seabirds ranging from the guanay cormorant to Peruvian pelicans and if we're lucky you might even see one of the famous Humboldt penguins. 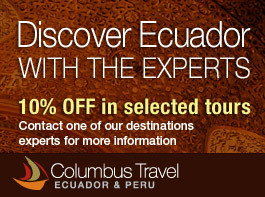 Afterwards, return to Lima (3hrs trip) and drop off at your hotel. Includes the overflight to Nazca Lines, private transportation with local English speaking guide, all meals and accommodation according to itinerary, visits to the sights and entrance fees. 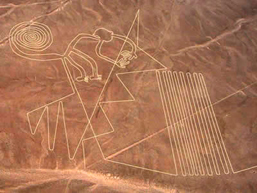 *Note: The flight to Nazca Lines is subject to weather conditions and it could be done this day or maybe the next day in the morning. Peru trains policies: only one carry on per person consisting of 5 kg/11lbs and a maximum dimension of 157cm/62 in. Please pack your bags accordingly.